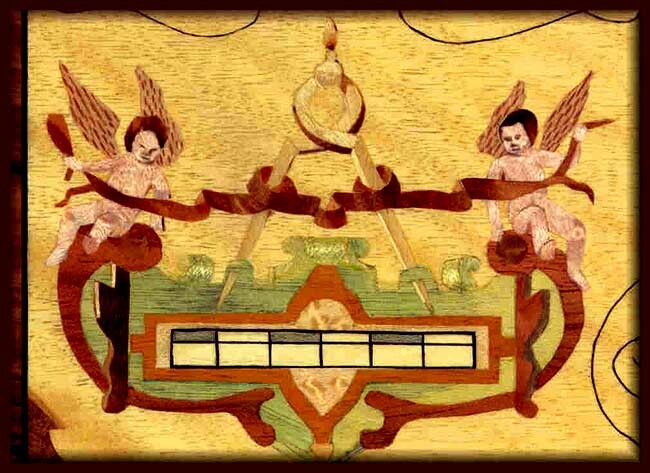 By Alan Mansfield of the Redbridge Marquetry Group, U.K. In the last lesson, you made your first marquetry picture using standard veneers. Now we look at how to use the different kinds of faults, or defects, which are found in veneers. I'm talking about knots, wild figuring, distortions and all the other problems that would possibly cause a cabinetmaker to reject a piece of veneer. In marquetry, faults and wild figuring can prove to be ready-made picture elements. For instance; if you take a look at a sheet of bird's-eye maple veneer (shown at right), you will at first see a sheet of creamy pink veneer that has masses of small knots. These very knots, however, are the prime attraction of that veneer for the marquetarian. A similar effect is caused by Masur birch, the disfigurement being caused by parasites but creating a wonderful visual effect when carefully used with other complementary veneers. Knots and disfigurement make wonderful shapes that can be used for depicting facial elements such as eyes and ears when you are placing people at a certain distance in your marquetry picture. These veneers are useful when depicting unpaved highways and byways. The regular size of the birds' eyes somewhat restrict the size of a person in the picture. However, faults in other varieties of veneer may prove more suitable. 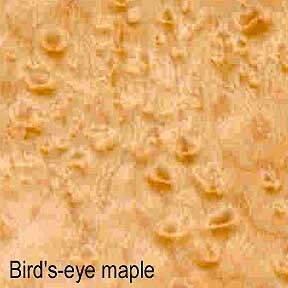 In Figure 1 (below), you can see an example of one of the small knots in some bird's-eye maple. I used this to form the knee of a cherub (or Puti) in a Marquetry picture of an Elizabethan-style map of Britain in the fifteenth century. You will see that the knot, when carefully selected and oriented, describes an excellent knee for the little fellow. The grain pattern around the knots found in many other varieties of veneers also have their uses and attractions for us. An important point with these grain patterns and configurations is that we often find gradated tonal changes that we can use for shading and shaping effects. This often saves having to cut in pieces of veneer to make these tonal changes, ending up with a mass of glue cut lines which spoils the smooth tonal transition. While I'm on the subject of smooth tonal changes, let's take a quick look at shadows and shaping in portraiture work using the medium of marquetry. If you cut in slight shadows in order to give a nose some shape or cheeks some roundness, you may end up with a patchwork-quilt lookâ rather than a smooth gradation from light to shadow. The veneers I favour for these purposes are ash and olive ash. If selected and orientated with care, the tonal changes can be made with with ease. You will see what I'm talking about if you take a look at Figure 2 (below). Some veneers, because of the nature and pattern of their figuring, lend themselves well to various tasks in marquetry pictures. Perhaps you may wish to incorporate a pleasant looking sky into your picture - but what veneer would you choose? Well, I would recommend aspen for a warm afternoon fairly cloudless sky. For a light-colored sky you could use sycamore or ash, but just take a little care with the selection. With ash, you will in most cases be looking for a reasonably linear grain pattern, although in some instances you will be able to make good use of the grain pattern distortions if you select them with care. Primavera and cherry are also used quite often for sky effects. One rather unusual veneer I chose as the sky veneer for a picture a little while ago was, I believe, a piece of rogue mahogany curl that I found in our Redbridge Group's shop. 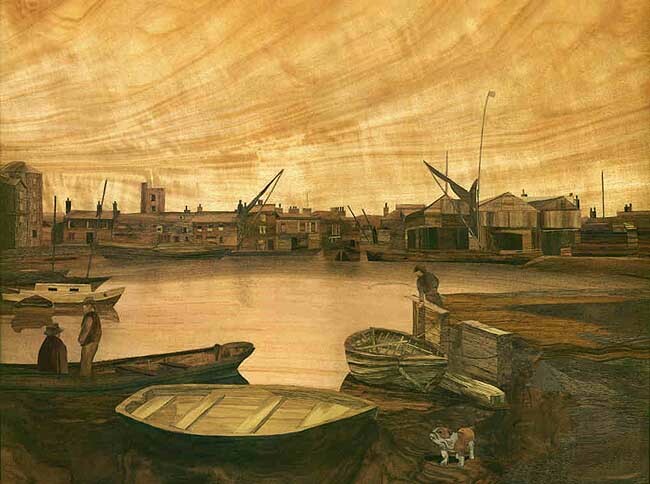 The picture was of an imagined view of Barking Creek, a local tributary of London's River Thames, in the 1840s. I had to use the veneer very carefully because it was only just large enough to fit its place in the picture, but, none the less, it fulfilled its role perfectly. You can see the end result if you take a look at the accompanying photo (Figure 3, below) of the picture. For the "wrong" sort of veneer, I think it does the job very well. An obvious type of veneer with masses of naturally occurring faults is a burl. They are cut from large warty growths that protrude from the trunk of the tree and, by their very nature, are irregularly shaped. Burl veneers differ from straight grained types and the cabinet and furniture trades absolutely adore them. The masses of defects are the actual attraction of the veneers. They have always been used for decorating top quality furniture and because of their relative rarity are very highly prized. For the marquetarian, burl veneers offer a lot of natural advantages. For instance, if you are depicting foliage (trees, masses of plants or curly animal fur, etc.) a piece of burl can often complete the task. Look at the example of trees seen at the Royal Observatory at Greenwich in London (figure 4). I made these trees from reference to my own sketches and photographs made at Greenwich so that I could check their authenticity in real life rather than copying them out of books or someone else's photos. I used a number of different varieties of burls in order to get a random look to the trees. Without resorting to fragmentation, I think they have achieved the desired effect. The only drawback is that the edges of the foliage could do with being a little more diffused to slightly break up the edges of the trees' leaves against the sky, but as this picture was made quite a few years ago, I'll forgive myself this minor oversight! 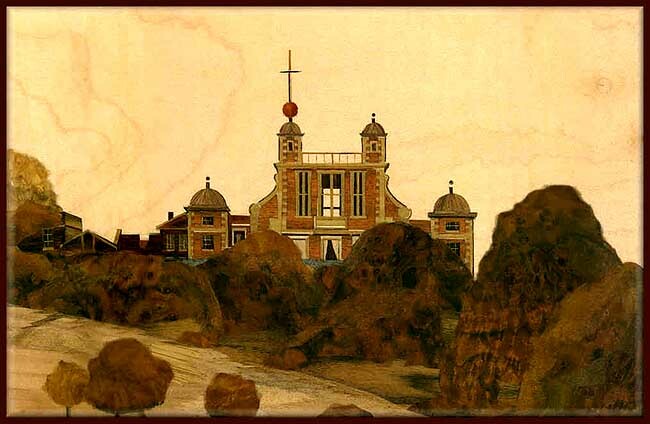 The next example is a picture of John Flamsteed, who was the Royal Astronomer at the Greenwich Observatory when it was first built. I made his face from defects in various veneers. The design of the face was taken from a couple of photos I took of a marble bust of Flamsteed that was on display at the Greenwich Observatory. As I only had my own photos to work from, I had no preconceived ideas of which veneers to use for undertaking the task. I eventually settled on using ash and olive ash for the main structure of the face. The darker parts are generally varieties of walnut carefully selected for their tonal values. A lot of the shaping in the face is achieved by nothing more than orientation of the veneer, rather than cutting in darker and lighter pieces of different veneers. When you are doing portraits as small as this one (which is less than 1-1/4" by 5/8"), it is important to try and avoid visible glue lines. You do this by virtually wedging your veneer pieces into the picture. This forceful method ensures a tight fit for the pieces, and gives a smoother look to the portrait. This method only works with smallish portraits (or a small section of a larger picture, as in this instance). 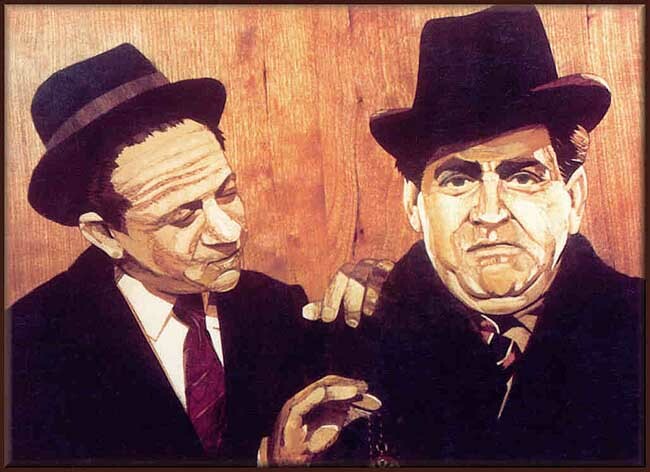 The drawback with larger portraits is that you are very unlikely to find large pieces of veneer with the required grain patterns and figuring to accomplish the task in one piece. In the UK, veneers are 1/64" thick, whereas in the U.S they are generally 1/32" or 1/28". This difference in veneer thickness tends towards blade or scalpel cutting in the UK, and saw cutting in the U.S. The thicker veneers have a definite advantage when it comes to finishing as they are difficult to sand through. However, they do have a slight drawback when it comes to spontaneity in cutting. Saw cutting doesn't give you the slicing line of a knife cut, so try a few practice pieces prior to cutting the actual pieces required for the portrait. It may be worth having a word with your veneer supplier to see if they can obtain some of the UK 1/64" thick veneers for you so that you can have a try at scalpel (or blade) cutting of your veneers. If you do manage to get some, make sure that all the veneers required for your picture are the same thickness. Otherwise, you will have a mixture of thick and thin veneers making the sanding process very difficult to control. Thicker veneers can actually be knife cut, but ensure that your blade is well waxed. This lubrication will help avoid repairing blades that have broken at the tip. Next month, we will look a little further into some more of the topics covered here and investigate the subject of sand shading, and its uses in pictorial marquetry. 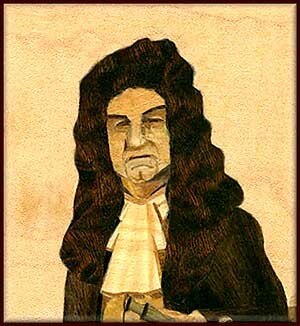 Until then, enjoy your marquetry and "happy cutting" (or sawing! ).